In the past, when designers developed plans for a building, they had the safety of one type of building user in mind: the occupant. They ignored or overlooked three other types of users with serious safety concerns: demolition, construction and maintenance workers. Jimmie Hinze, a construction safety expert, hopes he is helping to change that mindset through his research, his industry partnerships and his outreach efforts. Designers can make decisions about structural features, like poured-in-place concrete versus precast concrete, that would make a facility safer to dismantle. They can choose to add features, such as easily accessible light fixtures or permanent roof anchors, that affect the safety of maintenance workers. Hinze has devoted his 25-year career to making construction projects safe for all those involved. His book, Construction Safety, is considered the standard text in the area, and has written two other textbooks: Construction Planning and Scheduling and Construction Contracts. In addition to research on integrating safety into design, Hinze has explored the causes of various construction injuries, the effects of worker education and training on safety, and the effects of company policies on safety. “If workers are safe, and they feel comfortable about being safe, they’re going to do a better job,” Hinze says. In addition to presentations to his academic peers, Hinze also makes a concerted effort to reach people in the construction industry through presentations and trade journal articles. The Construction Industry Institute has funded seven safety-related projects since 1986 and Hinze has been the lead researcher on six of them. 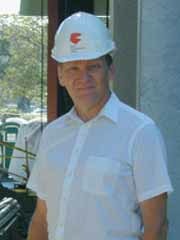 In 2000, Hinze became the founding director of the Fluor Program for Construction Safety at the University of Florida, sponsored by Fluor Corp.